Now here's something that no self-respecting sci-fi fan should be without this summer. If you want to break the ice at your BBQ this year, then the Star Wars: Lightsaber BBQ Tongs are sure to cause quite a buzz. Nothing is quite so boring as standing by the grill turning over those sausages and burgers and watching as everyone else has all the fun. Now you can be the centre of attention and break the ice with guests you don't know that well. 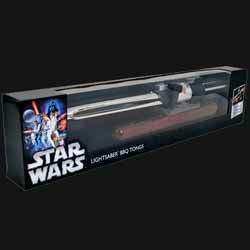 To use them, simply remove the protective cover and press the button on the handle, this separates the tongs and also provides a neat sound effect of a Lightsaber powering up, humming and moving around, before it shuts down. And, as you're picking up the sausages and burgers, you can press the button again to repeat the sounds. 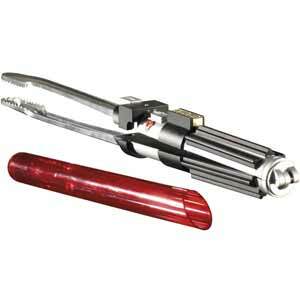 When not in use the tongs neatly clip together and then can be housed in the provided red plastic cover, which gives it the appearance of a stubby, ready for action, Lightsaber. There's not much more to say, other than this could be about the coolest pair of tongs on the market.